Elfstedentocht: This insane 120-mile speedskating race makes the Winter Olympics look easy. 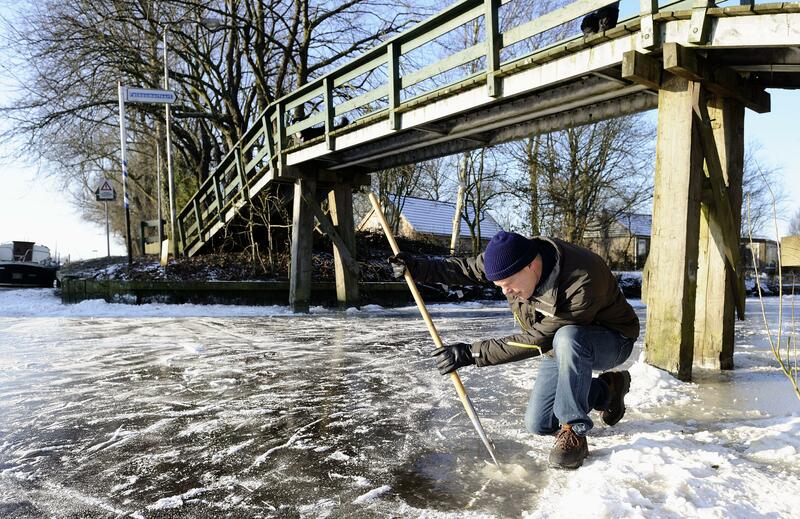 On Feb. 7, 2012, a Dutch volunteer measures the thickness of the ice on a canal in northern Netherlands to see whether the annual Elfstedentocht can start. As the 2014 Winter Olympics draw to a close, one thing, at least, is clear: The Dutch are the greatest speedskaters in the world. The Netherlands won 23 speedskating medals in Sochi; the second-most-successful nation, Poland, only won three. Why are the Dutch so good at speedskating? For one thing, the sport is a bonafide national obsession. (Seriously: I hope someday to care about anything as much as the Dutch apparently care about speedskating.) And if you want to understand the depths of that obsession, it helps to understand the Elfstedentocht. The Elfstedentocht—Dutch for “Eleven Cities Tour”—is a 200-kilometer outdoor speedskating race over the frozen canals of Friesland, a northern province of the Netherlands. It has been described as “the Super Bowl, Stanley Cup and World Series rolled into one”—and it might just be my favorite athletic event of all time. The race was first held in 1909, and has since become a national tradition, an epic test of Dutch citizens’ endurance, athleticism, and sanity. On the website Cafe Babel, a fan posted an ominous ode to the race: “Think, endless stretches of ice in a barren landscape/ Think, the wind cutting on your face and sweeping snow in your eyes/ Think, frozen toes, fingers, noses and ears/ Think, the hardest race in the world.” Sign me up! And I think that explains why the Dutch are so good at speedskating. All year, they look forward to this horribly grueling outdoor skating contest, and when it doesn’t happen, they console themselves with more skating. Now that’s devotion! With global temperatures trending upward, some wonder whether conditions will ever again be right for the Elfstedentocht. Let’s hope so. Until then, the Dutch will have to console themselves with continued international dominance of a sport that nobody comes close to caring about as much as they do.